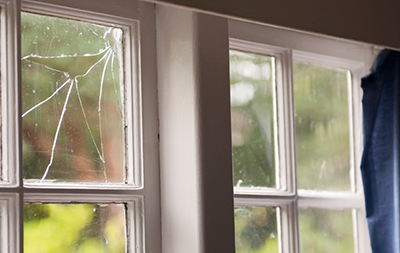 Heated or conditioned air escapes easily through broken windows, driving up energy use — and costs — in one’s home. Boone, N.C. — High Country residents are invited to enter the “2018 High Country Home Energy Makeover Contest” for a chance to win up to $2,500 in home repairs that improve energy efficiency, make their home more comfortable and reduce monthly energy bills. The grand prize winner and four semi-finalists will receive free home energy audits to determine which improvements each home needs the most. To qualify, applicants must be a residential member (customer) of Blue Ridge Energy (BRE) and meet certain financial requirements. The contest was launched today by the Energy Savings team at Appalachian Voices, a Boone-based nonprofit organization that advocates for a shift to clean, renewable energy for a healthy environment in the Appalachian region. Contest partners include the High Country Nonprofit Sustainability Initiative, which is funding the project, and reNew Home, Inc., a local business that will conduct the energy audits and home improvements for the grand-prize winner. Appalachian Voices sponsored its first home energy contest in 2014 in the High Country region. On average, applicants were spending more than 8% of their monthly income on electricity and gas — nearly three times the national average of 2.7%. More than a quarter of applicants had spent 15% or more of their income on energy bills between November 2013 and October 2014. “Retrofitting local homes to be more energy efficient also helps reduce harmful energy-related pollution while growing local jobs and economic development opportunities,” says Rebecca Bauer, North Carolina Energy Savings Outreach Associate at Appalachian Voices. Many families in the region are unable to benefit from energy efficiency because they fall in the gap between being eligible for free, federally funded low-income weatherization assistance and being able to afford a loan to finance home upgrades. Some rural electric cooperatives have filled this gap by offering energy efficiency financing available to all their members. BRE has a loan program for some eligible homeowners, but does not currently have a program that fills this important gap. “Our Home Energy Makeover Contest is intended to highlight the opportunity that electric co-ops like BRE have to create programs that benefit all of their members, as well as the local communities they serve,” says Bauer. The High Country Nonprofit Sustainability Initiative was founded by students Lily Mize and Olivia Nelson from the Goodnight Family Department of Sustainable Development at Appalachian State University. While the initial goal for the project was to fund a grant to help local nonprofits become more sustainable, it grew to encompass fostering connections between the university and the local community. “After realizing that our project could potentially start a ripple effect, we focused more effort on making sure that this project could have lasting impacts, each year gaining more community support and funding potential until it becomes an annual, competitive, fun opportunity for local nonprofits,” says Mize. Apply online or by mail by the deadline April 20, midnight.